The Society of Professional Journalists announced today that my media-mythbusting book, Getting It Wrong, is the winner of the 2010 Sigma Delta Chi award for Research about Journalism. The award will be presented in September at the Excellence in Journalism convention in New Orleans. 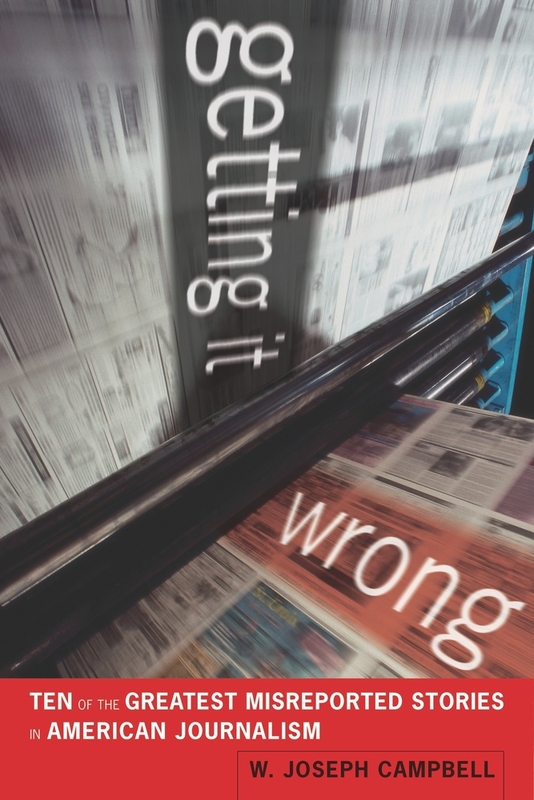 Getting It Wrong, which was published last year by the University of California Press, debunks 10 prominent media-driven myths, which are dubious tales about the news media that masquerade as factual. Remington-Hearst: William Randolph Hearst’s famous vow “to furnish the war” with Spain is almost certainly apocryphal. War of Worlds: The notion that the War of Worlds radio dramatization in 1938 caused nationwide panic and mass hysteria is exaggerated. Murrow-McCarthy: Edward R. Murrow’s famous See It Now program in March 1954 did not end Senator Joseph McCarthy’s communists-in-government witch-hunt; Murrow in fact was very late to take on McCarthy. Bay of Pigs: The New York Times did not suppress its reporting in the run-up to the ill-fated Bay of Pigs invasion in April 1961. Cronkite-Johnson: Walter Cronkite’s special report on Vietnam in February 1968 did not prompt an immediate reassessment or revision of U.S. war policy. Bra-burning: Humor columnist Art Buchwald helped spread the notion that feminist demonstrators dramatically burned their bras at a Miss America protest in September 1968. Watergate: The Washington Post’s intrepid reporters, Carl Bernstein and Bob Woodward, did not bring down Richard Nixon’s corrupt presidency. That they did is a trope that knows few bounds. Crack babies: The much-feared “bio-underclass” of children born to women who smoked crack cocaine during their pregnancies never materialized. Jessica Lynch: The Washington Post’s erroneous reporting about Jessica Lynch early in the Iraq War gave rise to several myths about her capture and rescue. Hurricane Katrina: News coverage of Katrina’s aftermath in New Orleans in early September 2005 was marred by wild exaggerations about extreme, Mad Max-like violence.